As temperatures drop and the snow starts heading towards Gatlinburg, let’s finally admit that it’s winter, that Thanksgiving is just days away, and that Christmas is in the air. Nothing kicks off this time of goodwill to all on Earth like the Festival of Trees held in Gatlinburg each Thanksgiving week. Tuesday, November 26, 2013 opens the week-long festival with the annual Grace Luncheon, followed by the procession to the enchanted forest of trees led by the Highlands bagpiper, ushering in the true start of the festivities – and for many, the beginning of the holiday season of giving. Kids love the festival, at which hundreds of Christmas trees arranged in maze-like groves and forests glitter and sparkle with thousands of lights and lavish decorations and ornaments, many of them handmade and unique. The richness and beauty of the setting is tribute to the local crafters and artisans who bring exceptional quality to the offerings of gifts and mementos available here. The children have their own crafts projects, including the rare madness of dressing up as gift boxes and being photographed for their efforts. Santa Claus is on hand to join in with the photographs, laugh with it all and memorize all the wishes. Of course there are Gingerbread Houses, a multitude presented by local individuals, chefs and local businesses and organizations, all competing for the various top places in the contest. The judging takes place on Tuesday evening, and also judged are the best & worst Christmas sweaters, among other categories, all worn to fame and glory at last by attendees of the event. The Festival of Trees is a benefit and prime fundraiser for Smoky Mountain Area Rescue Ministries (SMARM), the much loved charitable mission working tirelessly to aid the unfortunate in the local area. 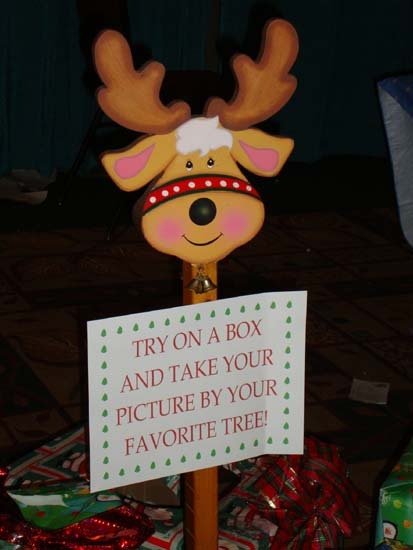 The organization provides a great favorite of the event all through the week in its Holiday Card booth. Pose for a picture and send it as a card or bring your whole Christmas list and make up all your custom holiday cards for the season. Handmade gifts to go with the cards are easily available also, courtesy of the artists and crafters contributing to the event. The holiday season is a time of fun, and Gatlinburg is privileged to be able to open up the season in such a giving and caring way. The Festival of Trees is a time of much delight and goodwill on earth. Admission is Free, and donations to SMARM are gladly accepted. 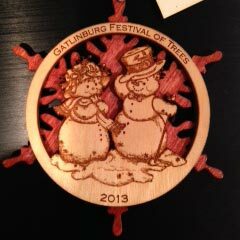 The Festival of Trees happens November 26-30, 2013, at W.L. Mills Conference Center (next to the Convention Center), just down Historic Nature Trail (Airport Road) from Stop Light #8 on Parkway in Gatlinburg. For full information check the Festival of Trees web site.